Chegodilu-A speciality South Indian snack from Andhra.It is tasty tea time savory treat made from a combination of Rice flour and all purpose flour(maida).It is delicately seasoned with spices ,rolled into round rings and deep fried to a golden brown colour till light and crispy. 1.Boil 1 cup water in a bowl, add salt to it. 2.When the water starts boiling, remove from stove, add ajwain, red chilli powder, turmeric and flours. 3.Stir with a ladle to make sure it is mixed well. 4.Pour ghee on it and cover.Once it cools, knead it to form smooth dough. 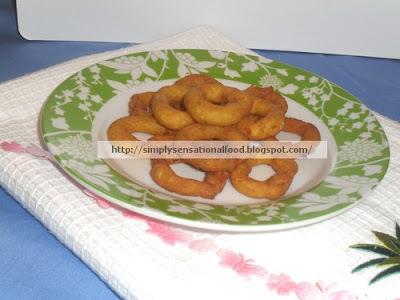 6.Fry them in hot oil til they turn golden in colour. 7.Drain on kitchen paper . This recipe was submitted to Indian Cooking Challenge. Just love it...crispy snacks prefect for this cold weather..
nice and crispy..long time since I had these. I have an eye in this snack from the time i saw in ICC,looks mouthwatering! Neat. 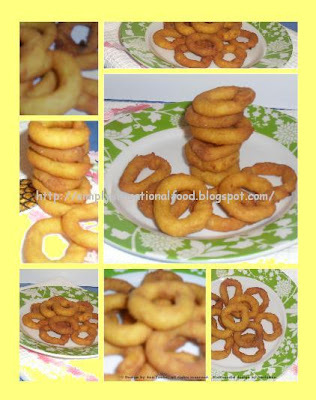 They look like onion rings. that's a nice patient work!!! looks perfect!!! I have tried doing it but never had the patience to end up successfully!!! you've got it great!! !